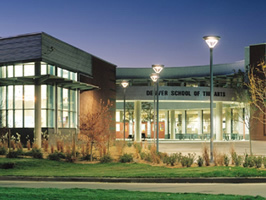 The Denver School of the Arts is a comprehensive secondary arts magnet school (grades 6-12) in Denver Public Schools. In addition to a rigorous academic program, students engage in intensive studies in Creative Writing, Dance, Music, Stagecraft and Design, Theatre, Video Cinema Arts, and Visual Arts. DSA is committed to fostering a lifelong love of the arts in a culturally diverse, academically challenging environment.